With Mile of Music only two days away, you’ve probably heard about The Autumn Defense featuring Wilco bassist John Stirrat and The Baseball Project playing with former members of R.E.M. But have you heard about The Redleg Rebellion? A “murder gospel” group with a front man dressed like a Victorian-era snake oil salesman and hobo zombie washboard player? 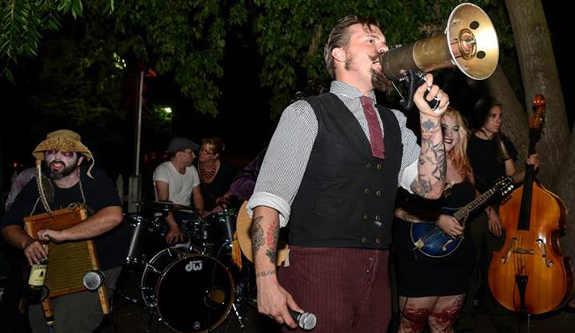 If you love good music and better whisky, you can find them playing the streets of Appleton this weekend. Back in 2012, The Redleg Rebellion started out with three members and was nearly called “Brat Water” due to a fascination two California transplants had with the Sconnie treat. Today, the band has seven members, five songs, and a robust fanbase in Appleton, Green Bay, and Milwaukee. The current lineup consists of lead singer Marcus Brooks, Jordan Shimon on banjo, Nick Lengner on upright bass, Ryan Engelhardt on drums/vocals, Angela Strauss on mandolin/guitar/vocals, Nick Chronis on washboard and banjo, and Levi Besaw on guitar. They’ve also been known to go by their stage names: El Baracho, Pistol Whip, Hades Hoodoo Hellfire, Sheriff Raw Dogg, Blaze Organa, Backpack Jack, and The Wanderer. Hard to remember? Don’t worry. Aside from the distinctive looking Brooks, many fans fail to recognize the band members even when they’re standing together. “They talk about this great band they saw called ‘Redleg Rebellion’ to us, not knowing we’re in the band,” says Shimon. If you haven’t noticed them on the official M.O.M. lineup, it’s because they’re not playing a venue. They’ve be “busking” the streets, setting up on the sidewalk and riling up the crowd like an old-fashion revival. Though their Facebook page describes them as “murder gospel”, the band has toyed with a variety of labels and influences such as contemporary roots, outlaw, folk, alternative country, and even punk. More important than their label, the band mates have an intense love of spectacle and crowd participation. The result is some crazy performances with pyrotechnics, dueling banjo solos, and even a brief addition of a professional side show artist from Coney Island. Attending a show could even mean becoming part of the band yourself since members have been known to pull the audience on the platform and hand them instruments. However, this experience is definitely NOT for the faint of heart. Between sacrilege antics occasional flesh wound made via stage makeup, it caters to a very particular palette. Where can you expect to see The Redleg Rebellion down the road? Well, having a great time, of course. With seven schedules to coordinate, finding an ideal performance time is a challenge, but one the band is more than ready to face. “Every time we have a band meeting, it’s always, ‘Are we having fun? '” says Ryan Engelhardt. The Redleg Rebellion will be playing in the streets at Mile of Music between Thursday August 5th and Sunday August 8th. If you need more whisky and strings in your life, check it out! You can follow The Redleg Rebellion on Facebook or visit their website at www.redlegrebellion.com. For more news from the local music scene, check out our interview with Christopher Gold here. This band is alright, their lead singer is a FOX though! REOWR !